The moment for this momentous collaboration arrived earlier in 2009 when interest in both a U.K. tour and album coincided with the availability of all family members to work together. 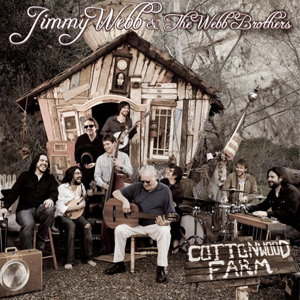 The result, 'Cottonwood Farm,' juxtaposes several new songs from the Brothers with a handful of treasures from Jimmy's archives - two of them previously unreleased, including the epic, 12-minute title track. Jimmy Webb's songwriting oeuvre includes some of the most oft-played and universally-recognized songs of the past century. In addition to penning several of Glen Campbell's signature hits, Jimmy wrote such classics as the Fifth Dimension's "Up, Up And Away" and Richard Harris' "MacArthur Park" (later taken to #1 by Donna Summer). Over the decades, literally hundreds of his songs have been recorded by a seemingly endless range of artists, from Ray Charles and Isaac Hayes to Linda Ronstadt and Art Garfunkel to R.E.M. and Urge Overkill. His first five solo albums recently were reissued (along with rarities and a live recording) via the box set The Moon's A Harsh Mistress: Jimmy Webb In The Seventies. As a performer, he blends his swift, biting sense of humour with elegant renditions of his timeless songs. Jimmy's sons Christiaan and Justin began performing together as the Webb Brothers in the late '90s, and released their first album, Beyond The Biosphere, on Warner U.K. in 1999. By the time their second album, Maroon, was released, they had brought their younger brother James aboard. All three brothers recorded the self-titled third Webb Brothers disc, which came out in 2003. Their albums received widespread critical acclaim (Magnet magazine recently cited Maroon as one of the "lost classics" of the decade); in addition, their songs were covered by the Magic Numbers and the Earlies, and remixed by Manitoba. They toured extensively throughout the world, sharing bills with bands such as Doves, Franz Ferdinand, the Eels, Guided By Voices and The Darkness. Jimmy Webb, his father Bob Webb, and his sons, The Webb Brothers––Christiaan, Justin, James and Cornelius––perform together as a three-generation family band. This is the first time in over twenty years that Jimmy has performed live with a full band, complimenting a successful career as a solo artist. Tim Walker joins the band on pedal steel and Cal Campbell on drums, continuing the longstanding Glenn Campbell/Jimmy Webb family tradition of collaboration. The new outfit combines the rock sensibility and youthful production of the younger Webbs with the timeless Americana grandeur of their father’s symphonic songs. Jimmy wrote 'Cottonwood Farm' in the early 1970s for his grandfather, and it proved an ideal focal point for the album, its various movements presenting character-roles for the family's many singers [including Jimmy's father Bob and his youngest daughter Camila]. 'Even though I didn't know it at the time,' Jimmy says, 'this album is the reason that I wrote this piece of music'.